My second entry for the Tale of Four Warlords #T4W 8th Wonder of Ghur are my Arkanaut Company, lightly converted from 40k Drukhari Wyches. These are a battleline unit using the Arkanaut Company warscroll. The backbone of any fishing, hunting, or adventuring expedition is the crew. Admiral Sailfin would go even further to say that his success is due to their skill, tenacity and loyalty. This is why he called them the Kingfishers, with a sound of royalty, because no matter the prize, this company of airfaring fortune-hunters can take anything the sky can throw at them; navigating an aetherphoon, skimming fresh water from a sky gargant pool, or hunting and snaring “Bigsails” the fastest and meanest fish in the ghyran skies. After the Pictures and Build + Paint sections, go read about the code that Sailfin and the Kingfishers live by. This unit uses the Drukhari Wyches from the 40k line to emulate the Kharadron Overlord Arkanaut Company warscroll, which is the battleline unit for this army. The success of this conversion/countsas is in making them feel like they exist on a fantasy skyship rather than a sci-fi spaceship. Arkanaut Company are armed with a pistol and cutter. Converted Wyches with Pistol and Cutters. The cutter was easy, but I felt that a slight modification to the wyches pistol would be required; simply giving it a more flared muzzle by cutting off the tip and drilling a hole. The duardin arkanaut pistols are pretty outlandish, so I felt that the wych version was simply of aelf design and perhaps more magically embued. The hardest part is emulating the specialty weaponry of the Kharadron Overlords. The aethermatic volleygun is probably the most difficult to pull off with the skypikes being the easiest. 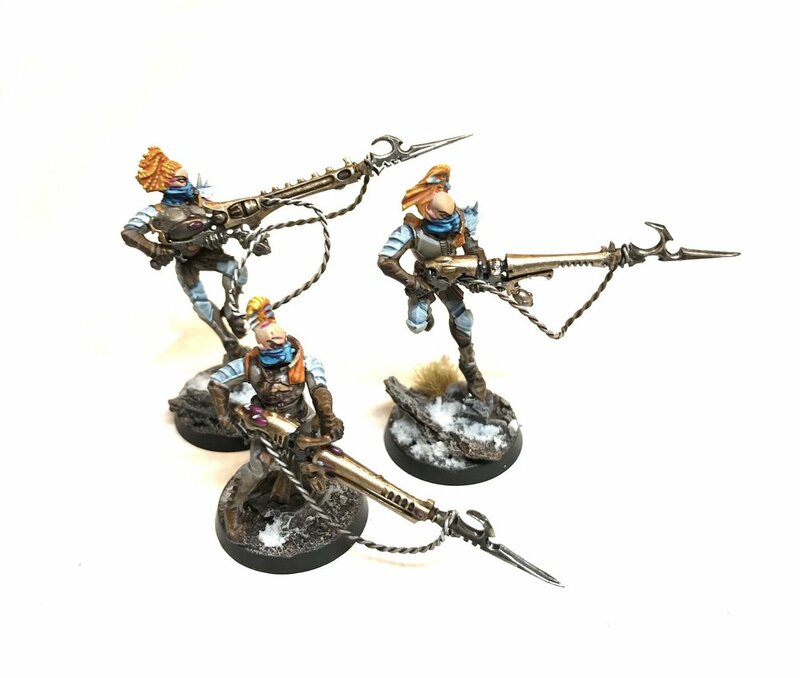 For this unit I wanted to do the Light Skyhooks which are like harpoon guns. After I was satisfied with the structural comparison, the only thing left that could help me sell these fantasy wych Drukharidron was the paint scheme. For the main clothe of the suit, I wanted something humble and a bit dingy or earthy looking. The sparse armor matches Admiral Sailfin’s blue ivory set, anything to keep it from being plate armor. I felt that leggings, boots and gloves had to be leather, and I wanted something dark to contrast the mid-tone clothing. Everything had to be a bit scratched and dinged up to sell the physicality of day to day wear and tear. 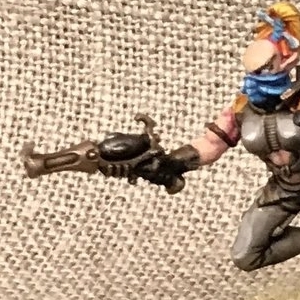 Then, I needed to use bright colors to contrast them to the dark morbid tones of the Drukhari. The sails of the Bigsails and the sails of the ship are going to be like Admiral Sailfin’s cape, oranges and yellows…so the hair also became orangish yellow. Consequently, it also fits with the bright adventurous mood of the army. The Kingfishers are known and respected in free people’s seaports and kharadron skyports alike, lauded as fair and merciful in their dealings. Don’t mistake this for law abiding or friendly. While they can be trusted to hold up their end of any bargain, but they survive by not trusting that others won’t. They’re not afraid to balance the ledger if and when it needs balancing. As all companies do, the Kingfishers also live by Admiral Sailfin’s code. Keep your prey always in sight, enjoy the breeze that’s given to ya, and at the end of it all balance the ledger. Aboard the Aether Dance, Jord’ahn and a handful of kingfisher arkanauts pursue another sky vessel, though not one powered by the aether. He shouts above the sound of the wind “Eyes sharp, this ‘cutter agent is no whelp.” The skycutter they are chasing is appearing larger as the frigate closes the gap. The rotation of the frigate arcs towards the position of the skycutter and the air crackles as aether is ignited to launch the heavy skyhook towards the chariot. The swiftfeather whips to the right. The chariot angles just right and the harpoon impales the floor of the chariot, splintering wood and metalwork. But the ‘cutter already has momentum and reeling it in would spin the ship. Jord’ahn curses aloud, “Sync up your movements until you can line it up and get ready to set the hook!” as he jumps off the bow and grabs the line with his body. After attaching a clip from his own harness, he begins to zip down the length of the rope connecting the two ships. He won’t fall off the rope, but smashing against one of the two ships wouldn’t do at all. Feh’tar hugs the ground, masking his intent. He grabs a satchel from a hidden compartment and tosses it over the edge. Jord’ahn curses again, “Choosing your pride over doin’ what’s fair. Now I have to balance the scale.” and raises his pistol. The aetherpistol screams and the hawk shrieks and the cutter begins to fall. Jord’ahn frees the harpoon embedded in the cutter’s hull and lets it carry him back to the Aether Dance. Next month i’m going to focus on the Maneater, Crulg, and 2 of his kin mentioned in the story in my last #T4W post. These three actually belong to a different army of mine, a cogfort theme, so it’ll be fun to switch schemes for a minute. After that I am dying to get at least one ship completed…so perhaps that’ll be end of December, or January.